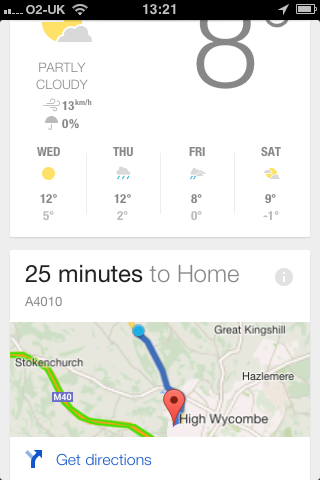 Google Now is the thing on the Google mobile app which displays "cards" containing hopefully helpful information, like how long it will take you to get to work. I liked the idea, but as my journey to and from work usually takes the same amount of time, it was never really much use. I was going to blog about the sorts of cards I'd like to see them do, but I could only think of one thing: tell me how long is left on the washing machine. However, now those clever people at Berg have done something even more useful - made a washing machine tell you when it's finished. Here's the short version of the news. Here's the long technical explanation with lots of juicy detail. The Guardian have picked up on it too. Happy (slightly belated) Birthday Mac! Should I cycle to work or not?